In contrast to most other polysaccharide gels, alginate gels can develop and set at constant temperature. This unique property is particularly useful in applications involving fragile materials like cells or tissue with low tolerance for higher temperatures. An alginate gel will develop instantaneously in the prescence of divalent cations like Ca2+, Ba2+ or Sr2+ and acid gels may also develop at low pH. 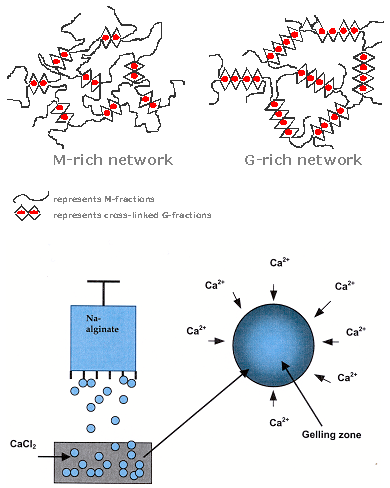 Gelling occurs when the divalent cations take part in the interchain ionic binding between guluronic acids blocks (G-blocks) in the polymer chain giving rise to a three dimensional network. Such binding zones between the G-blocks are often referred to as “egg-boxes” and consequently alginates with a high content of G-blocks induce stronger gels. Gels made of M-rich alginate are softer and more fragile and may also have a lower porosity. This is due to the lower binding strength between the polymer chains and to the higher flexibilities of the molecules. The gelling process is highly dependent upon diffusion of gelling ions into the polymer network and there are essentially two main methods for the preparation of alginate gels: the dialysis/diffusion method and the internal gelling method. In the dialysis/diffusion method (diffusion setting) gelling ions are allowed to diffuse into the alginate solution. This method is most commonly used in biotechnology for immobilization of living cells in alginate gel. An alginate solution can, however, also be solidifed by internal gelation method/internal setting, i.e. in situ gelling. Here a calcium salt with limited solubility or complexed Ca2+-ions are mixed with an alginate solution into which the calcium ions are released, usually by the generation of acidic pH with a slowly acting acid such as D-glucono-δ-lactone (GDL). This method is chosen if the purpose is to create a homogenous, non-syneretic alginate macrogel to fill the space of a given container. The main difference between internal and diffusion setting is the gelling kinetics. Consequently, the gel network will also be different. PRONOVA™ UP is a series of highly purified and well-characterized sodium alginates developed for use in biomedical and pharmaceutical applications. Production is in compliance with cGMP ISO and ICH guidelines. A Drug Master File covering these products has been submitted to the US FDA. Diffusion gelling is characterized by rapid diffusion of gelling ions (e.g. Ca2+) into the polymer network. This high-speed setting is indeed utilized for immobilization purposes where each droplet and alginate solution makes one single gel bead that entraps the active agent/biological material. An important feature of the diffusion gelling is that the final gel may exhibit an inhomogeneous alginate distribution, as the alginate concentration gradually decreases towards the center of gel. The homogeneity of a diffusion gel can partly be controlled. A high degree of inhomogeneity is obtained by using a low concentration of gelling ions in the absence of non-gelling ions. A more homogeneous gel is obtained when gelling occurs in the presence of high concentrations of both gelling and non-gelling ions. Internal gelling is based on the addition of an inactive form of the cross-linking ion (Ca2+) into an alginate solution. Controlled release is usually maintained by change of pH or through the limited solubility of the calcium salt source.